Preserved flower design for your private jet cabin. We wish you all safe and happy travels for this festive season. This preserved flower arrangement is named after the French helicopter. Light and agile yet strong and durable our designs will last for hours and hours at altitude making them ideal for your cabin needs. Based in Tung Chung Hong Kong we can deliver to the HKBAC or anywhere else in HK and are here to support you. I would like to share our winter collections for home/office decoration. 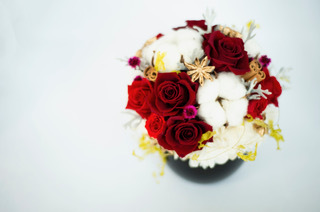 One day lesson - An opportunity to learn preserved flower arrangement on a holiday season design. I am happy to help you create your own wreath and candle arrangement. Lesson duration approx. 2-3 hours or more. Preserved green you can enjoy to decorate with our collection of special Christmas items. Our lesson schedules are flexible so please let us know your preferred dates (between 2 Nov to 11 Nov or from 1 Dec ~ ) and the time (weekends also available ). More than 3 people and I can come to your convenient place, home or office in Tung Chung for the lesson. Gift wrapped and delivery free in Tung Chung, Hong Kong. We look forward to hearing from you and making a special gift for the Christmas period. We have a good harvest of preserved flowers with our Autumn basket. Trial class and fun time with beautiful ladies! Let's share learning with your colleagues or friends with preserved flower lesson in Tung Chung, Hong Kong and you can chose the colour of the flowers to create own arrangement. with your preferred date and time for a class, or if you prefer to place an order we can deliver to your home or office. The Wreath size is 25-28cm in diameter with preserved gerbera ( which looks like a sunflower! ), eucalyptus,green leaves and rattan base. We had the pleasure of helping a wonderful new husband surprise his beautiful bride with a surprise Preserved Flower Lesson on the 1st of April. The young lady had no idea about the class, but with a special hand made note and small gift, she soon realised the lesson was just for her. With a love of flowers both her and her husband had a great lesson and created some beautiful flowers to take away. A long lasting momento from the honeymoon and time in Hong Kong.